Better PDF Exporter allows rendering various formats of linear (1D) and matrix (2D) barcodes to the PDF documents exported from Jira. The supported barcode formats include all widely used ones like the ubiquitous QR code, UPC (Universal Product Code) and EAN (International Article Number). See the precise list in the next section. Barcodes can be recognized by not only special hardware devices (barcode readers), but also by free barcode scanner applications that are available on any smartphone platform! The mobile phone applications make barcodes an effective tool to insert easy-to-use links and identifiers in PDFs, especially when using printed media. Encode the URL of an issue in its PDF export. Then, your users can open the issue in the browser simply by pointing their smartphones' camera to the QR code. 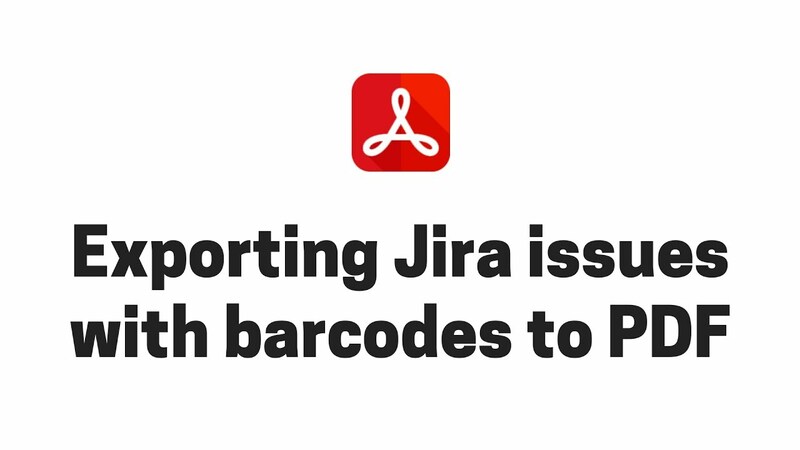 Print and attach tags to physical objects that are represented by Jira issues. If you represent an asset like a physical server with a Jira issue, you can print and attach a tag to the server which can be scanned by staff members to open the corresponding issue. When managing purchase requests with Jira issues, get the product code of the item from a Jira custom field, then insert its UPC or EAN barcode to the final document. This simplifies processing the purchase and eliminates errors at the same time. Add the QR code of the Jira saved filter or ad-hoc JQL search to the document that captures the search results. Users can go and re-run the search for the most current results any time by using their QR code readers. If you have a document type that exports only a part of the issue data, you can encode the link to the issue for those who need to see all issue details. For example, a story card will not contain the full description, but members of your Scrum team can scan the code and see the issue when standing in front of the physical board. In case of issue-navigator-fo.vm, there is an interesting automatic switch between two modes. This template is typically used either with a saved filter or with an ad-hoc JQL search that is entered directly to Jira's JQL input box. The important difference between those is that saved filters use shorter URLs (which use only the filter ID as a request parameter) than ad-hoc searches (which use the full JQL string). Longer URL means longer data to encode in the QR code, which results in smaller black and white squares, which are harder to read. issue-navigator-fo.vm intelligently recognizes these cases. If it finds the ad-hoc search case, it renders a larger QR code to effectively compensate the effect of the smaller squares. That way the QR code remains easy to read. This type of adaptive sizing may be a technique to consider also when implementing QR codes in custom templates. You can easily add barcode and QR code rendering capabilities to any template. * Returns the barcode in Base64-encoded PNG format, using the default resolution. * Returns the barcode in Base64-encoded PNG format. * @param content the data to encode in the barcode (most typically a URL). * @param barcodeFormat barcode format to generate. * @param width image width in pixels. * @param height image height in pixels. The argument barcodeFormat is a string, one of the format names listed here. Note that different barcode formats support different length of content and different characters in the content. For example, while QR codes can encode any character, Code 11 only supports the digits (0-9), - and *. For the details of each format, we suggest checking its article in Wikipedia. In the next sections, you can find working examples for various encoded data types and code formats. You can easily copy these to your own templates. As you can see in the examples above, you can separately set the resolution (horizontal and vertical resolution in pixels) and the physical size (with and height in metric units) for the barcodes. The rule is relatively simple: for those barcode formats which support variable length data, the more data that needs to encoded, the more "complicated" the code becomes. For example, in case of the QR code, "more complicated" means smaller black and white squares. To find the optimal values, simply test if your barcode reader can successfully read the code. If it can, set lower resolution and smaller physical size and try again. Repeat this until the reader has difficulties. In our experience, barcodes are easier to read from paper than from an LCD screen! Therefore, if your primary media is paper, you can use lower physical size. If you look for some formal recommendation, you can use the formulas recommended in this article. The default templates are using sensible defaults, but feel free to change those in the template code if the codes are too small or too large for your use case. The barcode Wikipedia article gives a great overview. It also has links to the articles of various barcode formats and to the technical specification (constraints on the encoded data) of those. Therefore it is a great starting point. The QR code Wikipedia article is a great resource about QR code in general. Better PDF Exporter is using the ZXing ("Zebra Crossing") open source library to implement barcode rendering. We strongly suggest to read the ZXing documentation if you need more flexibility by accessing ZXing in a lower level. If you don't already use a code reader app, we recommend QR Code Reader for the Android platform. It is free and popular. Plus all the examples above were successfully tested with it.